Noko is an overweight office worker who copes with bullies at work and an abusive boyfriend at home, by eating. Unfortunately, this creates something of a vicious cycle, as the more she eats the bigger she gets and the more abuse her co-workers heap upon her. While things look like they couldn’t get much worse for Noko, she’s about to discover that they can. 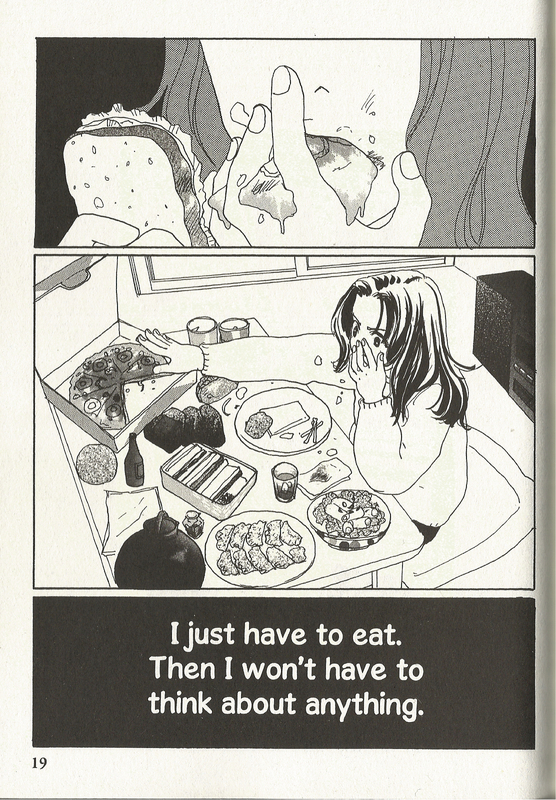 Published in 1997 as part of a weekly magazine aimed at adult women, In Clothes Called Fat is Moyoco Anno’s unnerving portrait of a woman’s struggle with her weight and lack of self esteem. This is not an easy or light hearted read. Nearly every character who appears in this book is broken and damaged in some way. Whether it’s Noko’s self-destructive streak which gets progressively worse throughout the volume, or her co-worker Mayumi whose entire sense of self worth seems to be based upon her ability to ridicule and put down those who weren’t gifted with her good looks, or Noko’s overly religious and bitter co-worker Tabata, everyone is damaged. Unfortunately for Noko, she’s often the target of everyone else’s issues. What starts off as verbal and mental abuse escalated quickly thanks to Mayumi. She flaunts an affair with Saito, Noko’s nominal boyfriend, frames her for another co-workers mistake, and ultimately engages in a scheme that feels over the top given the more grounded themes of the book. Saito, for his part, does absolutely nothing to help Noko. Due to his own issues, Saito encourages Noko to remain overweight while periodically ignoring her and cheating on her, returning to her because she’s safe and one of the few things in his life that he has control over. This too slowly escalates as Noko seeks to lose weight, culminating in a particularly disturbing scene where he physically abuses Noko, jamming food down her throat while screaming at her to keep eating. With most stories like this, such a scene would lead Noko to leaving Saito, but not in In Clothes Called Fat. Instead, her mental deterioration simply continues as she begins to engage in even more self-destructive behavior in an attempt to keep Saito around. In Clothes Called Fat is an incredibly dark and grim read that might catch folks by surprise, as there’s virtually no light at the end of the tunnel. At one point Noko joins a spa to help her loose weight, only to encounter more abuse from the spa workers and no help thanks to one of the weaker subplots in the book, involving an elderly paramour Noko had a one night stand with. Noko never quite gets the kind of help she needs, but neither does anyone else. Readers will be left hoping that one of characters would exhibit some degree of self awareness and get the therapy they so desperately need, but it never comes. The cycles of abuse continue until they culminate in mental breakdowns, arrests and medical emergencies. If this were an American story, In Clothes Called Fat would probably end with Noko standing up for herself and either accepting her body or working towards changing it in a healthy manner, probably while meeting a man along the way who loves her for who she is. Moyoco Anno eschews all this and instead gives a haunting, disturbing tale which avoids the pitfalls and cliches that would come from it being an uplifting and affirming story. Instead she gives an honest and all too real look at Noko’s psychological downward spiral, which ultimately makes In Clothes Called Fat an incredibly unsettling read that’s bound to stick to your ribs long after you’ve put the book down. In Clothes Called Fat are available now from Vertical Comics. 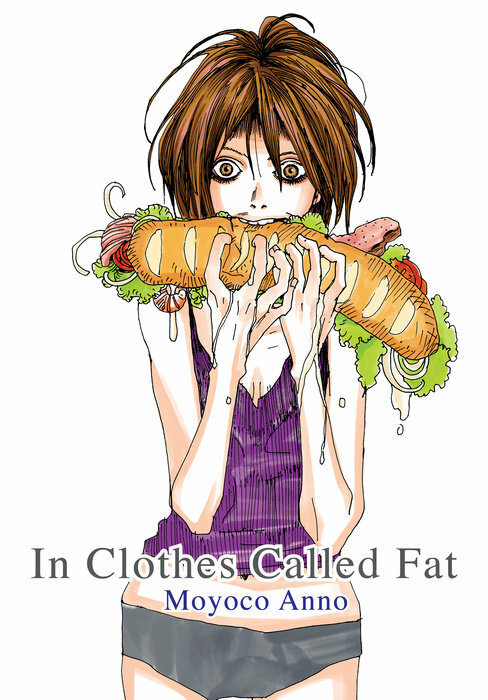 Categories: Manga Reviews, Reviews Tags: In Clothes Called Fat, Moyoco Anno, Vertical Comics, Vertical Inc. Missing Link » Arkisto » In Clothes Called Fat – aikamme mestariteos?